OPHIR — At a wooden table lit by candlelight Wednesday in this remote Iditarod checkpoint, mushers Kristy Berington and Andy Pohl shared a meal of moose lasagna and garlic bread. Sure, they had just raced about 350 miles through Alaska wilderness with 30 sled dogs. Sure, they had not gotten much sleep. 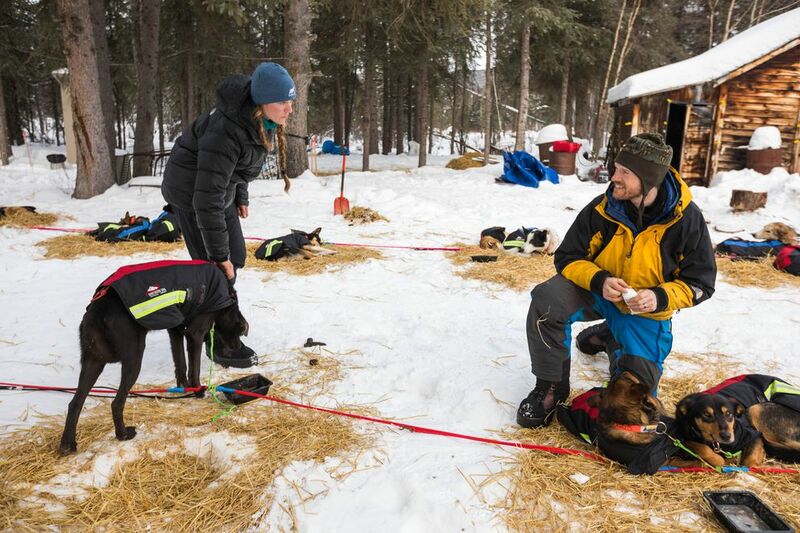 But, on the Iditarod trail, romance is not dead. "We kind of joke that we're taking our honeymoon in Nome, on the white sandy beaches," Berington said Thursday, her dog team parked next to Pohl's. The huskies curled up on straw near a familiar log cabin. Berington, 34, and Pohl, 43, married in July. But it was here, four years ago at this cabin in the ghost town of Ophir, that they first met. Berington, who runs a sled dog kennel with her identical twin sister in Knik, was competing in the Iditarod that year and Pohl was riding his fat tire bicycle about 530 miles, from Willow to Galena. She spotted his bike leaning against the cabin. She stepped inside to ask him about the trail. "I opened the door and it's a very small building in there and I picked Andy out right away, not just because he's incredibly good looking but because he had the least amount of clothes on and the only way you're going to stay warm with that amount of clothes is if you're moving constantly," she said. They talked. They took a photo. And then, she said, they "went on their way." A year later, at the 2015 Iditarod, they met again. This time, in Fairbanks, when the race start was forced north due to lousy trail conditions out of Willow. Berington went to look at the ice sculptures. "There was a big beautiful one of (a) dog team and I wanted a picture of it," she said. "I looked at the picture and there was a fat tire bike in the shot." She wanted to find the bike's owner, to see if they planned to bike the Iditarod trail. Who did she find? Pohl again. They talked. They snapped another picture. After that, Berington and Pohl kept in touch. Could she give him a tour of her sled dog kennel, he asked. She could. He took her on a long fat tire bike ride. "We found ourselves wanting to do something together every weekend," Berington said. "Got married in July. And now we're here." This is Berington's ninth Iditarod and Pohl's first. They shared their reunion dinner Wednesday night before forging on for the remainder of the 1,000-mile race. The couple left Ophir on Thursday. She is currently in 40th place. He is 41st. "Having Kristy out there on the trail is amazing," Pohl said, his arm around her as they talked near their sled dog teams. "She's very patient with me, which is a blessing."